Take a guided tour through the Aix-en-Provence daily food market with Chef Kathy and purchase the freshest ingredients to prepare your day’s meal. In a private kitchen, just a few minutes from the market, you’ll make a full three-course meal with those ingredients. Your meal will include a starter, main dish with vegetable side, and dessert, with wine. This is an all-day class where you’ll learn and practice many cooking skills and techniques. Classes are limited to a maximum of 6 people to ensure that everyone gets individual attention and a truly hands-on experience. During the market tour, you’ll learn how to shop like a local as Chef Kathy shows you the best the market has to offer. 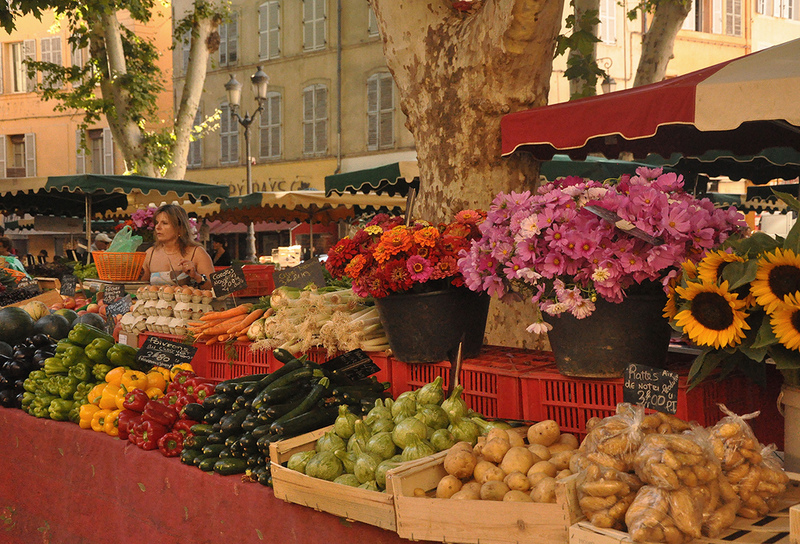 A Provencal market is one of those things you really must enjoy during your vacation. The bright and bold colors of Provence and its markets are on full display. As varied as the colors are, so are the scents that fill the air. At the end of your walk through Aix’s daily market, you’ll be inspired to create delicious dishes with these ingredients. Take this class, and a fabulous market-to-table meal is on its way. Includes: One-hour market tour with tastings, cooking class with a full three-course meal, a buffet of appetizers from the market to sample while we cook, wine with the meal and booklet of recipes from class.